New York Times bestselling author Teresa Medeiros absolutely dazzles in this quick-witted, laugh-out-loud funny, and highly moving love story that will set readers’ hearts atwitter. Taken under the wing of one of her Twitter followers, “MarkBaynard"—a quick witted, quick-typing professor on sabbatical—Abby finds it easy to put words out into the world 140 characters at a time. And once she gets a handle on tweets, retweets, direct messages, hashtags, and trends, she starts to feel unblocked in writing and in life. After all, why should she be spending hours in her apartment staring at her TweetDeck and fretting about her stalled career when Mark is out there traveling the world and living? Teresa Medeiros is a New York Times bestseller who wrote her first novel at the age of twenty-one, introducing readers to one of the most beloved and versatile voices in romance and women’s fiction. She has appeared on every national bestseller list, including the New York Times, USA TODAY, and Publishers Weekly lists and currently has more than 10 million books in print. She is a two-time recipient of the Waldenbooks Award for bestselling fiction and lives in Kentucky with her husband and her two cats Willow and Buffy the Mouse Slayer. You can visit her website at: TeresaMedeiros.com. "Goodnight Tweetheart is exactly the book to warm you up on a cold winter's night. Tender, funny, and poignant, this novel will make you laugh out loud one minute and reach for the tissues the next." 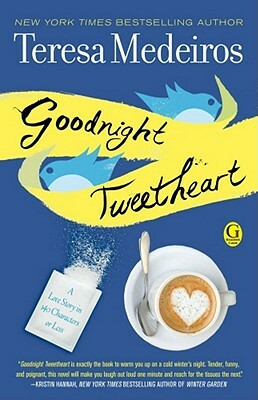 "Goodnight Tweetheart measures out equal amounts of lightning-fast wit, wry intelligence, and haunting tenderness. Medeiros shows that in any era, by any means of communication, love will find a way." When Mark and Abby first "meet" on Twitter, Mark isn't entirely truthful about his identity. Do you think it's common for people to wear "masks" when they first meet someone? To present themselves as the man or woman they believe the other person wants them to be? What do you think about the statement Abby quotes to Mark during their first "date"? : "You'll never have more in common than you do on your first date." Have you ever had immediate chemistry with someone you've met, either in a friendship or a romantic relationship? Do you believe it's a physical response or an emotional one? Do you believe in love at first sight? Or love at first tweet? Abby shares her favorite book, Peter S. Beagle's A Fine and Private Place, with Mark. Have you ever found common ground with a stranger by sharing your favorite book, movie, TV show, or piece of music? Is that a mating ritual or just a common way that strangers often bond? If you were to tell someone your favorite book at this precise moment in your life's journey, what would it be? How does it reflect who you are and/or your belief systems? Abby says the central theme of A Fine and Private Place is that death gives life meaning and life gives death meaning. Do you believe this to be true? Does life being finite give us even more reason to celebrate every moment of it? If you could do something special to celebrate your own life, what would it be? How do you feel Abby's relationships with her parents colored her relationship with Mark? Would you have been able to forgive Mark for his deception? Do you feel like Abby's response was appropriate? Would you have gone harder on Mark or easier on him if faced with a similar circumstance? Did you notice any hints about Mark's situation in their exchanges that Abby may have missed? Abby and Mark both mention music in a way that tells you it's important to their lives. If you could pick out a song to reflect their relationship, what would it be? Have you and a significant other ever shared a special song you considered "yours"? At one point Mark says, "Irving, like Jerry Seinfeld, knows the only way to survive this life is to view it as some sort of absurdist tragic-comedy." Do you think he was being overly flippant or do you find that humor helps you cope with the challenges of your own life? Do you believe that social media sites like Facebook and Twitter enhance intimacy or make it more difficult to achieve? If you were writing the ending of Mark and Abby's story, what would it be?